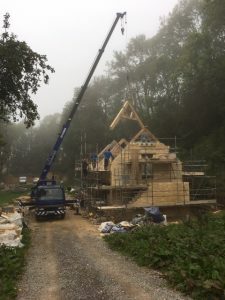 How traditionally made oak roof trusses solved a Cotswold developers challenge with Timberpride’s expertise and customer service. Deep in the beautiful valleys of South Gloucestershire Bob was midway building a coach house using traditional construction techniques of Cotswold stone and oak roof trusses. The project was well underway but the trusses had yet to be sourced. Here’s how Timberpride brought life to the oak trussed roof for Bob’s development. A shrewd business man, Bob is experienced in developing properties, and has a good feel for the aesthetic, what he considers to be good price whilst appreciating there is more to a product or service than just a low price. Bob approached three oak framing companies for a price to the supply trusses, at this stage he had not realised that some companies make oak frames by a robot, not using traditional hand skills. Alec explained that the robot frames are produced with round joints and due to the lack of human discretion require joinery grade quality timber. 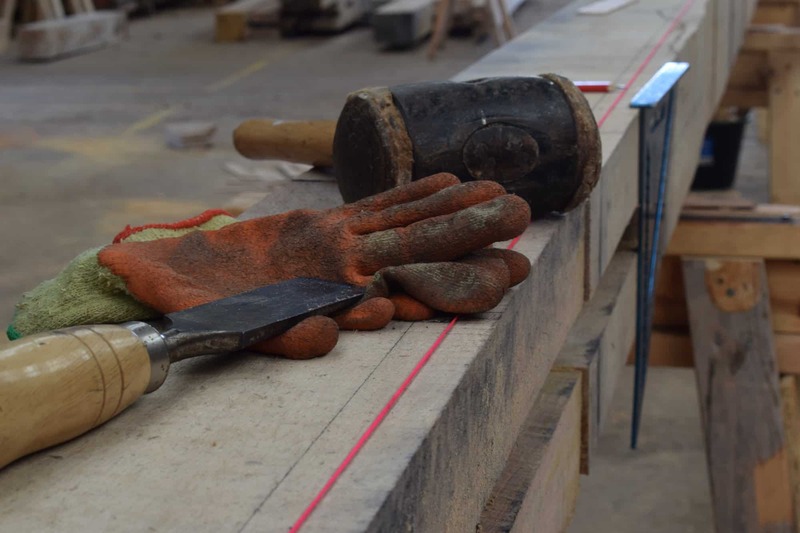 Whereas our skilled craftsmen will hand cut square joints scribing individual joint faces to fit seamlessly in the correct grade of oak which will withstand the twisting and moving of the oak frame in it’s lifetime. Bob realised there was more to the purchase of the trusses than price alone, he needed and valued the expertise of a company that truly understands oak, from the woodland it grew in through to the nature of it’s behaviour and be able to work with the material accordingly. Timberpride produced CAD drawings of the Raised Collar Queen-post Trusses detailed in the drawings supplied and raised an estimate for price and production time. On finalising and agreeing all the details our skilled staff started the process by selecting oak logs to mill beams ahead of the framers starting work. Throughout the process Alec and Kim kept Bob up to date with progress including a visit to the workshop to see the trusses taking shape. Once completed the trusses were dispatched in flat pack to site for installation. I just wanted to drop you a line and say a big thank you for all your help with designing and delivering on time the lovely oak A-frame for my coach house. Everything went extremely well and to plan, including personal delivery of some of the oak from Alec, the owner and his son. In this day and age of online sales and aggressive pricing it’s a great experience to be able to walk into your lovely oak offices, meet the owner, take a look behind the scenes and at your oak waiting to be hand crafted into your designs. It’s a true Cotswold experience and well worth the small premium for the excellent service and to be able to engage first hand with all the processes.